This photo was taken in early June 2012 at about 10 am. The location was once again on the fringe of our Pond Beyond at Fairview, Virginia. The "Take It!" came from my notice of the long view of the mower marks made after many sweeps having been done in the same way over a period of time. The precision of these marks was made more pleasing to the eye as there was an incline at the edge of the field that gave it a little upward kick for a conclusionary border. After having made the initial photo of the parallel stripes I took a few steps and for some reason looked at the lawn again. 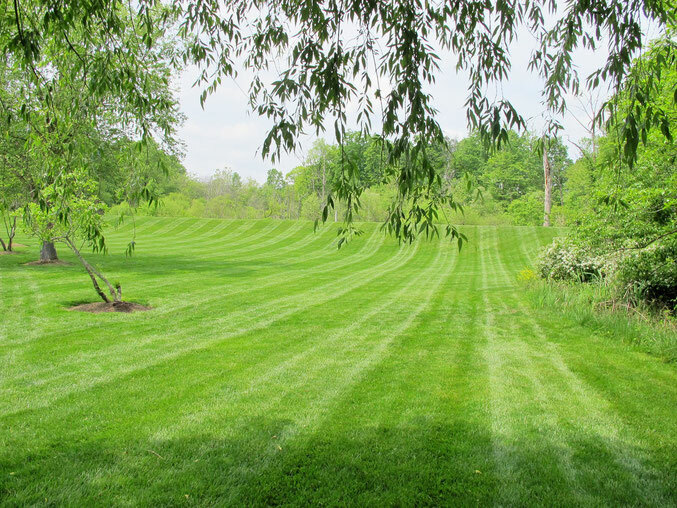 What revealed itself was the crisscrossing patterns which had also been laid down that added so much more delightful texture to this already inviting stretch of lawn. The After Take: To all I have shown these photos to, there has been a near universal reaction. It seems to be one of having seen something that was visually soothing. A look of "I want to go there" seemed to also be a strong part of the viewing of these two pictures. Here is hoping there is a great patch of lawn somewhere near you that you can spend some time with and enjoy its possible soothing effect. Thanks for joining us for the current photo presentation. You are cordially invited to return Tuesday, October 2nd for a new picture that we hope you will enjoy. PS: I must say, when showing these photos I was all caught up in the huge difference in the patterns shown while most of the viewers seemed to not give much of a care to this aspect. It seemed they were lost in the strength of the attractive invitation this location had offer. Man this brings back memories. I grew up having to mow the lawns with a John Deere. Compliments to the operator. His lines are perfect! Ray, I cannot help but wonder what kind of estate you grew up on that got you a ride on mower. We just had a little lawn - thus we had a push mower, that I used for neighborhood lawn jobs. Gabe and Sarah, Great potential question from both of you. Wonder if they used a string line or a laser in the beginning to get it all straight. If I occasion on the lawn crew I will ask them. It has almost a football field look to it. This would be my husbands worst nightmare. He hates mowing the lawn.